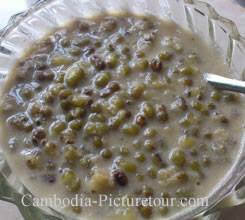 Mung bean pudding is not too sweet, very easy to make and very delicious Khmer food. This authentic Khmer recipe have been around since the early century and became very popular after the visited from Chinese ambassador Zhou Daguan in 1296. The presentation was that the yellow mung bean meaning gold , and the tapioca sauce for water that representing the lucrative wealth of Khmer Empire that once ruled most South East Asia. 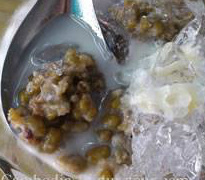 Yellow mung bean pudding was Zhou Daguan favorite Khmer desserts during his stayed in Cambodia. Back then yellow mung bean pudding was renamed to Daguan. But through out the years the name changed again, first was Ta Guan short meaning for the honorable ambassador Daguan, then to Ta Xuan. Superstitious people slurps this pudding to hope for richest and wealth. 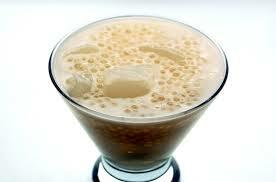 But others slurps yellow bean pudding because they loves the great taste of Khmer food. Sino Khmer Krom prefer this bean pudding with crispy, hot, cut up fried bread"chaway". In a small pot, put 4 cups water with mung bean and cook till bean tender (do not over cook). Pour cooked bean in a colander, drained and set a side. In a large non-stick pot, put water, sugar, salt and tapioca flour together, stirs constantly while simmering till sauce thicken, add cooked mung bean, stirs well. Serve hot or warm with prepared coconut sauce . 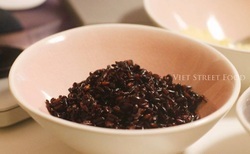 Black sticky rice dessert is the one of favorite Khmer Dessert. 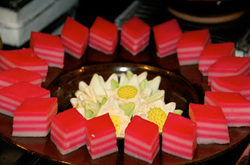 By the way at Thai and Malaysian they knew and used to have this dessert as well. The dessert was a rice pudding flavored with coconut milk. When raw, Black rice appears black and rounded medium grain. Upon cooking, its color changes to a deep purple and it is non-glutinous rice. It has a relatively high mineral content (including iron) and, like most rice, supplies several important amino acids. Black or purple rice is unmilled, leaving a dark husk in place, which colors the grains when it cooks. The husk leaves a chewy bite to the dessert. As it is unhulled, black and purple varieties of rice are classified as brown rice too. And it was very yummy. So you can bought the rice at the Supermarket and used it instead of our regular rice for rice pudding. Cooked it with water first and then with milk and condensed milk and it came out a beautiful lilac color, with a nutty chewy taste. The only drawback is that it has a longer cooking time so cooking it on gas is a long process. It has been suggested to soak it overnight to speed up the cooking. It has not yet been tried as a rice dish but since we like the wild rice, my guess is that it would taste similar. Moreover, is not have only Black sticky rice but it just have White sticky rice as well. You will need: Black Rice- 1/4 cup Milk - 4 cups Condensed Milk- 1/2 tin (more or less depending on your sweet tooth) Preparation: 1. Soak rice overnight. Boil rice in plenty of water till half done. Better still, add 1 cup water and pressure cook till one whistle comes, and then cook for 5 mins on very low heat. Drain excess water and keep aside. 2. Heat milk, bring to a boil, add the rice and let it cook on low heat till the rice is fully smashed. This may take anywhere between 10-20 minutes. After it is cooked, add condensed milk and let it simmer for 10 minutes. The more the rice is cooked before adding the milk, the better. Pressure cook the rice even after adding the milk but it gets messy. Serve hot or cold. Num kom s’det khieu. (Sticky rice cake with mung bean.) Steamed sweet sticky rice flour cake with mung bean filling is delicious Khmer ethnic food. The Pyramid shape cakes are a religious symbol representing the Buddhist pagoda towers, where souls emerge from the top on their path to reincarnation. Traditionally, on Memorial day for ancestors ( Pchum ben/Don-ta), Visak( Buddha birthday) and especially Cambodian New Year(Bon chol thnam thmey), would make or buy *num kom* for food offerings. •	Ingredients : o	12 oz Peeled mung bean, washed and rinsed o	4 Cups water o	1 Tablespoon vegetable oil o	3 Tablespoons Chau Doc coconut cream powder o	1 Tablespoon pure vanilla extract o	¼ Teaspoon salt o	2½ Cup sweet rice flour o	½ Cup sugar o	½ Cup palm sugar o	¼ Teaspoon salt o	1 Teaspoon vegetable oil o	½ Cup coconut milk o	½ Cup cold water o	2 to 3 Packages frozen banana leaves or fresh banana leaves •	Procedures : In a medium pot, put mung beans with 4 cups water and cook till mung bean tender. Pour cooked mung beans in a colander, drained and set it aside. Pre heat a non-stick skillet or wok; add 1 tablespoon vegetable oil when wok is hot. Sauté cooked mung beans with coconut cream powder, vanilla and salt, stirs well, turn off the stove and set it aside to cool off. When the mung beans are cool to touch, scoop 1 teaspoon prepared mung beans and put it in a palm of hand, shape and roll it in to a small ball. Continue until mung beans gone, should have 14 balls. When done set mung bean balls a side. In a large bowl, mix 2 cups sweet rice flour with sugar, palm sugar, salt, oil, coconut milk and water together, mix and kneads flour by hands till dough smooth. If dough sticky add a little more of remaining flour. Flour dough should be smooth, firm and not stick to finger when touch. Take out a small piece of dough, shape to round ball with your palms. Then uses your fingers and shape flour dough to flat thin round sheet. Take 1 mung beans ball put in the center of round dough sheet. Gently pull dough over the mung beans ball to seal it. Rolls and shape dough to a round ball by your palms. When done set a side. Continue till the dough gone, should have 14 dough balls. 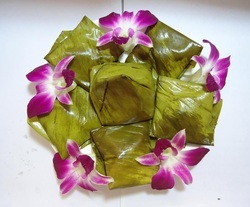 WRAPING CAKES: Cut banana leaf out to 28 pieces by 8x7 inches in size. If you use frozen banana leaves, need to defrosted it first. Washed and wiped each piece of leaf with paper towels. Spread one piece banana leaf flat on cutting board in length wide. Put another piece banana leaf on top, cross wide. Pick up bottom ends of leaves fold over to form a triangle shape. Folds over the end again to shape like a funnel. Pick up the funnel with pointed end on your palm. Drop a dough ball in the funnel and pressed the leaf cover tightly over dough ball. Folds and tucks the bottom of leaf under to form a triangle shape. Tuck and fold over other 2 corners so that all 3 corner form in like pyramided. Adjust and tucks the bottom of the cake evenly at each sides. When done set a side and continue to wraps cake until dough ball gone. Put cakes in the steamer and steam it for 1 hour. Serve warm or cold. Note: *Num kom* can keep in refrigerator for a week or in freezer for a month. Just re-steamed or re-heat in microwave till the dough soften before you eat. 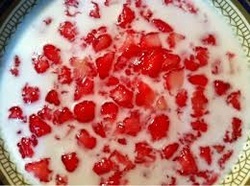 Tur Tim Grob, coconut milk based dessert that is very popular when the weather is hot. 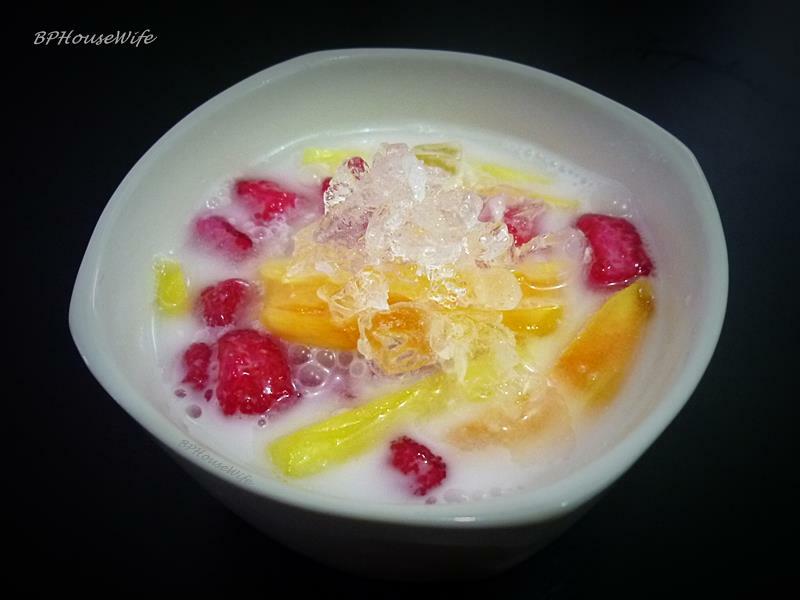 The small reddish/pinkish jewels are water chestnut covered with tapioca flour, served with sweeten coconut milk and shaved ice. Shredded jackfruit and jellied coconut flesh can be added to this dessert to make it extra special. 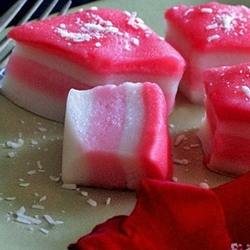 Jellied coconut flesh occurs when the coconut lacks an enzyme that turns its flesh into a normal coconut flesh. The flesh continues to develop in the jelly state. Tur Tim, in Khmer word translated literally is either ruby or pomegranate. Unfortunately, there were no historical facts that we can rely on for how this dessert came about. 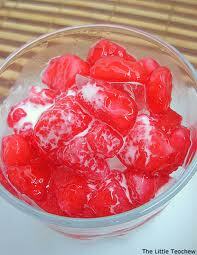 However, if you look at Cambodia’s neighbor, Vietnam, this exact dessert exists. The red kernels are known as pomegranate. 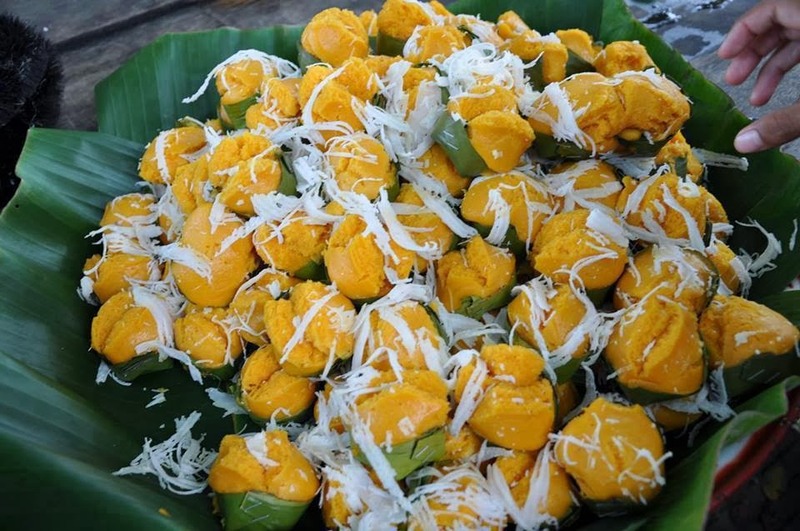 When visiting Phnom Penh, try 'tur tim grob' with jackfruit and the jellied coconut. The taste, texture and fragrant of the combined ingredients is indescribably delicious! Procedures: Cook sweet-rice with one-cup water in an automatic rice cooker. When sweet-rice cooked, separate cooked sweet rice with spatula and set it aside. Cook coconut milk in a large non stick pot till sauce thicken. Add sugar, salt, banana or vanilla extract, stirs till sugar dissolved. 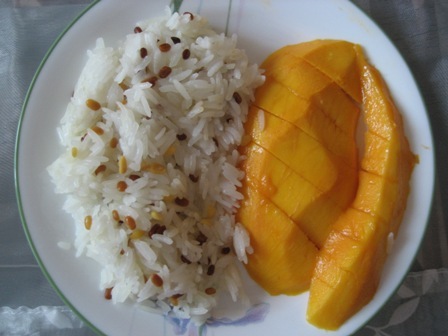 Add cooked sweet rice in with coconut sauce, stirs well, add shredded coconut meat and stirs well. 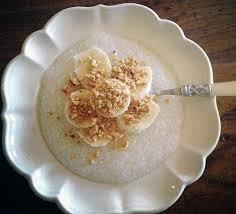 Spreads prepared sweet-rice evenly on a cake pan or container. Sprinkles roasted sesame seeds on top, use spatula to pressed down sesame seeds and let it set for few hours. Cut into square pieces before serve. 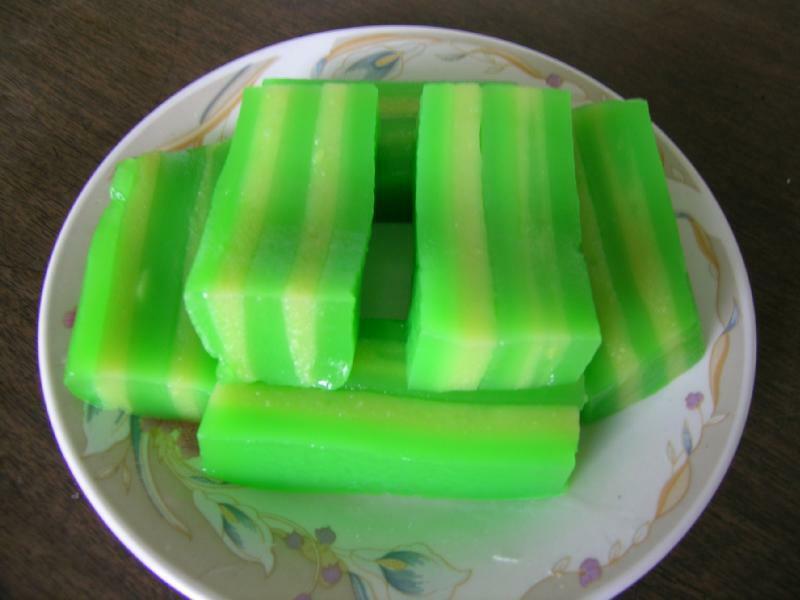 Green bean dessert is one of popular desserts for Cambodian. People usually having dessert after their lunch or after they are off from work in the evening. Dessert stalls are common in Phnom Penh and also mobile stalls which selling many kinds of popular Khmer dessert. Most of desserts are easy to prepare that Cambodian people also like to cook dessert at the weekend for whole family serving. 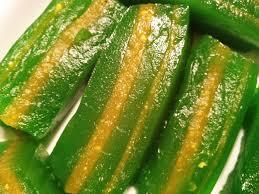 If you also would like to try green bean dessert by your own, you can refer to the recipe below. 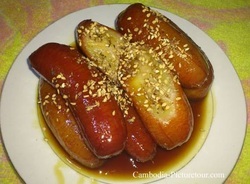 This is a popular Khmer dessert made of Namva banana. It’s called Chek Chheung (ចេកឆឹង). 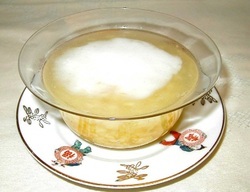 Chheung means to cook sugar until it becomes thick or turns into syrup. 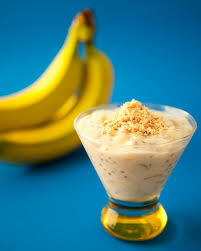 So Chek Chheung is a kind of dessert which banana is cooked with thick sugar. Chek Chheung is easy to cook; we can do it at home. 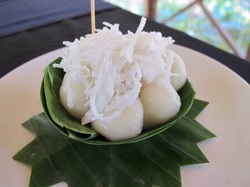 For this dessert it’s called Sticky rice cake balls in Khmer we’re called ‘Num Plae Ai’ with a small bit of palm super inside and fresh coconut. 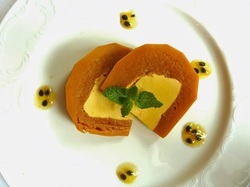 When you bite it for once, the source inside of this dessert will explode all into your mouth and I guess you will like it, because the taste of this dessert it’s very delicious. Num plae ai is very easy to prepare, here is how. 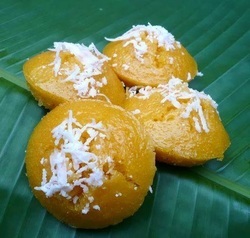 Ingredients - 250 g sticky rice flour - 100 g palm sugar candy: cut it into small cube pieces (about the size of your finger tip) - young grated coconut Preparation Mix sticky rice with about 100 ml of water, then the flour turns into a form of soft that we can make it into any shape. Now make it into balls of about 1.5 cm in diameter, then insert the sugar cube into the ball as filling. Have a pot of boiling water ready on fire with moderate heat. After the ball is inserted with sugar cube, put it into the pot, when the balls float up, they are cooked. Take it out to another bow of cold water. One minute later, drain it out to a basket with holes. The process is continuosly like this.By Sak Chan Nita. How to cook his pumpkin pastry cream recipe, a truly delicious replica of spiced pumpkin pie custard, can be used in profiteroles, Napoleons, éclairs, tarts, and Génoise cake. The use of crème patisserie is limited only by your imagination; grace a simple or an elaborate French dessert recipe with it. The results will be equally delicious. Preparation:In a small saucepan, warm the milk over low heat until it is just hot enough to steam. While the milk is warming, whisk together the egg yolks, pumpkin, sugar, flour, spices, and cornstarch until the mixture is completely smooth. This pumpkin pastry cream recipe makes enough pastry cream to fill 1 standard pastry or cake recipe. By Sak Chan Nita. This is one of the best dessert ever. It is called 'Ah Kor Tnort' in Khmer. I dare say every Cambodian likes this. Well, there is no reason to dislike this kind of delicious dessert. The color itself is very attractive. 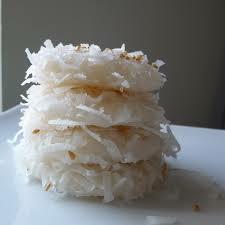 It is usually topped with shredded mature coconut, which adds flavor to the taste of the dessert. 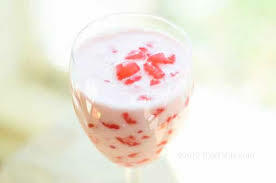 And I would like to inform the tourisms, don't miss this dessert when you are visiting Cambodia. Sticky Rice Layer Cake is made of sticky rice and tapioca flours, and is both gluten and lactose free. 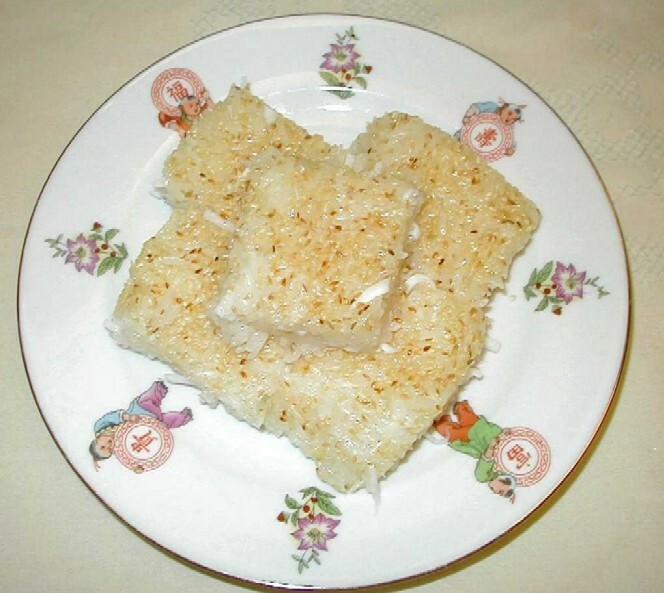 A truly Cambodian dessert, this type of sticky rice cake can be found in many markets or restaurants in Phnom Penh, with slight variations according to the region and the chef. It has a satisfyingly sticky texture and tastes of coconut. Especially, it is a great with tea or coffee, this cake makes a nice dessert, breakfast, or snack with afternoon tea. Or make it for a potluck party where it will be eaten up in no time. Let enjoy eat Sticky Rice Layer Cake at anytime, anywhere together! By Pen Dara. Ancient banana trees are everywhere, they are one of the most useful and sacred plants that have been in Cambodia for thousands of years. Banana plants are uses in many ways, we use the young banana blossom for cooking, and banana leaves for wrapping rice cakes and many other foods. Chopped banana stalks make great food for pig. Young green bananas taste great raw or cook. Ripped bananas we use for religious food offerings, eaten raw or turn into delicious desserts. There are so many varieties of banana available at the market, but the most prefer type of banana that Khmer Buddhists uses for food offering is ladyfinger (miniature) bananas. This recipe taste better with fresh ladyfinger bananas, but I substituted with canned bananas because where I live that type of banana is hard to find. 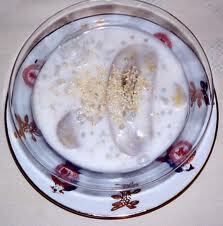 Banana and tapioca pudding is easy to make and delicious Khmer ethnic recipe. 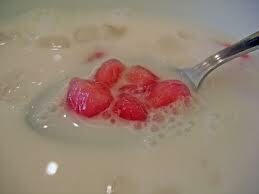 In a large bowl, soaked tapioca pearl with hot water for 30 minutes, drained and set a side. Cook 2 cups water in a small pot, add canned banana in boiling water and cooked it for 1 minute, drained and sliced thinly length wide, set a side. Note:If you use fresh banana, peeled and boiled with 2 cups water for 5 minutes, drained and sliced thinly length wide, set a side. In a non-stick pot, put coconut milk, tapioca, salt and sugar together, simmering till tapioca tender and coconut sauce thicken. Add cooked banana, stirs well.